While we were in the middle of testing the company's X4 headphones, Jaybird surprised us by announcing a new pair of Bluetooth sport headphones, the Tarah, shipping Oct. 9, so we thought we'd try them out. 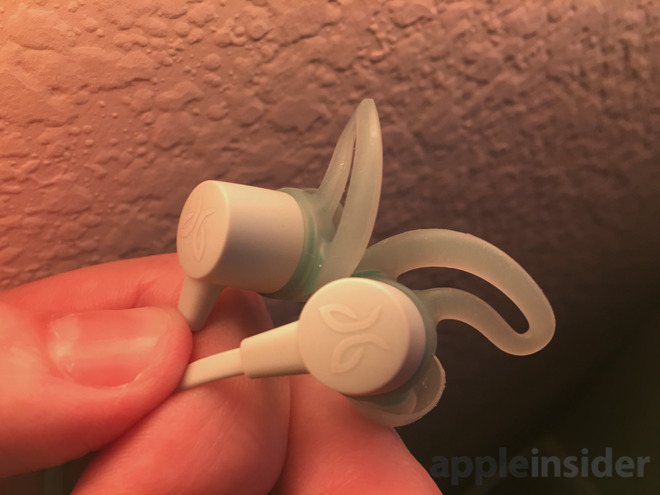 The Tarah replaces the Freedom 2 as Jaybird's "budget" option, costing $30 less than the X4 at $99.99. Our initial impressions are pretty good, such that if that the quality holds up by the time we complete a full review, we might even recommend them over the X4 for some people. Partly this is because the headphones are nearly identical, especially visually. In fact the only thing that separates them in that respect the inline remote, which on the Tarah is closer to rectangular while having rounded edges and more stylish buttons. It feels better in the hand, especially since you can tell the volume-up and volume-down buttons by touch and not just position. 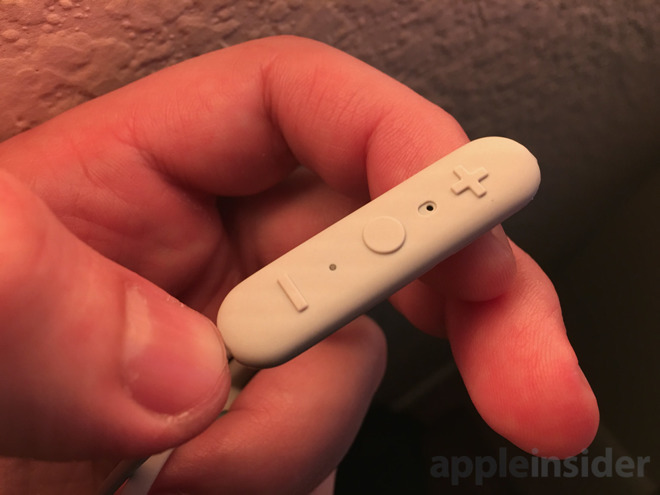 Setup is as easy as you want it to be: after charging, hold down the middle button until you hear the pairing prompt, then connect via software settings on your iPhone, Apple Watch, or other compatible device. You'll probably want to pair to your iPhone at least briefly, though — the Tarah supports custom EQ settings by way of the Jaybird MySound app, and by default it's tuned to be flat. 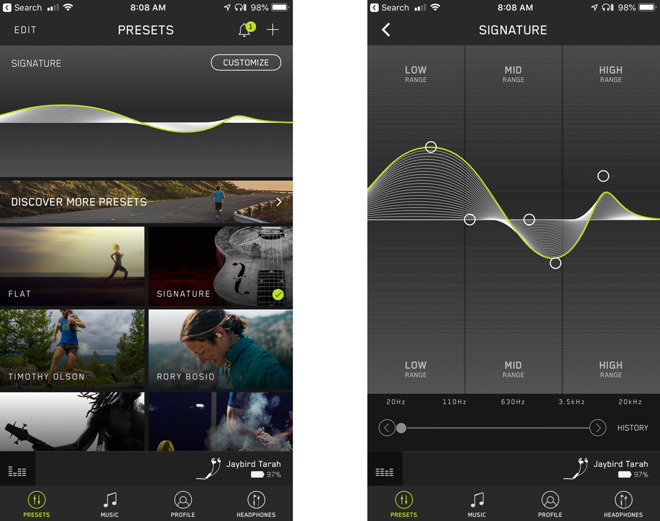 You can adjust EQ settings manually or choose from presets created by Jaybird, athletes, musicians, and ordinary users. The headphones actually sound pretty good flat, and unlike the X4, we preferred the "Signature" and "Bring the Bass" presets over "Extended Listening." Your mileage may vary, and we still need to put the product through varied situations, including of course the gym. Speaking of which, the Tarah uses the same comfortable and sturdy fin design as the X4 for keeping buds in place during a workout. Here, though, the fins are merged with silicone tips, so while there are three different sizes, that changes tip size at the same time — you can't mix-and-match. There are also no Comply foam tips in the box, so fans of those will have to buy them separately. Another sacrifice is that the Tarah has 6 hours of battery life versus 8. That means more frequent charging, and if you wear them at work, they'll last less than a full day. Keep following AppleInsider for our full reviews of the X4 and Tarah.